Floor coatings for your veterinary clinic provide a beautiful, durable, and sanitary way to protect your concrete floors. 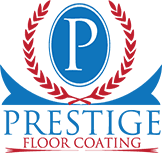 At Prestige Floor Coating based in Edgewood, Maryland, we can customize your floor coatings in virtually any way you like. With more than 580 floor colors and styles, your product choices are virtually endless. From standard floor coatings to beautiful stained or metallic styling to anti-skid safety flooring, our floor coatings are designed for any business, industry, and use. Are you looking for floor coating services for your veterinary clinic? Contact us today for services in Maryland, Virginia, Pennsylvania, and Delaware. Veterinary clinic floors receive a lot of abuse from nervous pets and foot traffic! Concrete flooring is popular in veterinary offices, but the material is porous, making cleaning and sanitizing difficult. Some veterinary clinics opt for tile or linoleum flooring, but over time these can break, rips, or peel, leaving your clinic looking unsightly. Surface wear – Vets know animal claws better than anyone! Animal claws marks, heavy foot traffic, and erosion from fluids or chemicals can ruin floors over time. Crazing cracks – Crazing is a process by which fine particles penetrate cement floors and allow water and chemicals to break through and erode the integrity of your flooring structure. Poor or insufficient structure – Does your flooring lack sufficient reinforcements? If you have noticed signs of flooring damage, don’t hesitate to call us! Weather and temperature damage – Pet paws and boots have a habit of tracking in damaging salt. At the same time, fluctuating temperatures can bend and crack the floors, ruining the paint or finish! To schedule floor coating services for your veterinary clinic in Maryland, Virginia, Pennsylvania, or near Delaware, contact us today! If your veterinary clinic floor needs attention, or if you’re opening a new veterinary office and you want quality floor coating, professionally applied, contact Prestige Floor Coating. Our floor coating experts will provide you with an estimate and help you choose the floor coating ideal for your business. Are you looking for floor coating services in Edgewood, Maryland, or nearby? Contact us today for services near you! Contact Prestige today and start showing off.